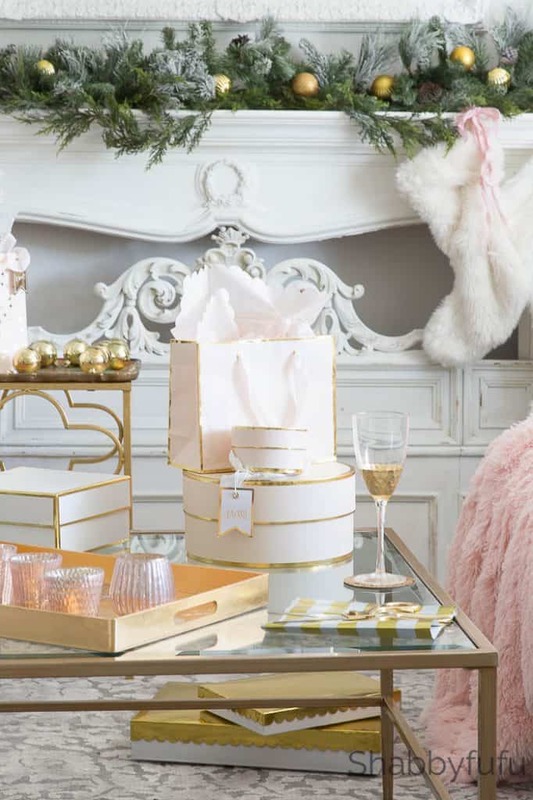 Blush pink Christmas ideas are not common in our town. There are a couple of neighborhoods that have an annual Holiday Housewalk where you purchase tickets and are able to go on in and snoop. They are mostly in the upscale areas or where historic homes are more prevalent. Have I ever seen blush pink in my area? 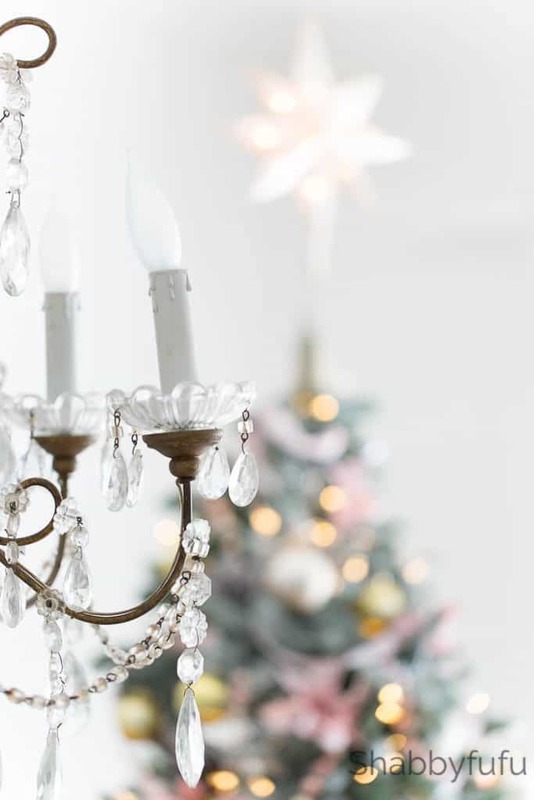 No…but I’m sharing my own holiday housewalk inspired by blush pink and I hope that you enjoy! Soft pastel shades are so easy and pleasing to the eye. When your walls are painted white (Benjamin Moore White Dove) you can go seasonally with accent colors in any tones that work in your world. Easy choice for me with blush pink, white, gold and soft greys with rustic natural elements in the mix. 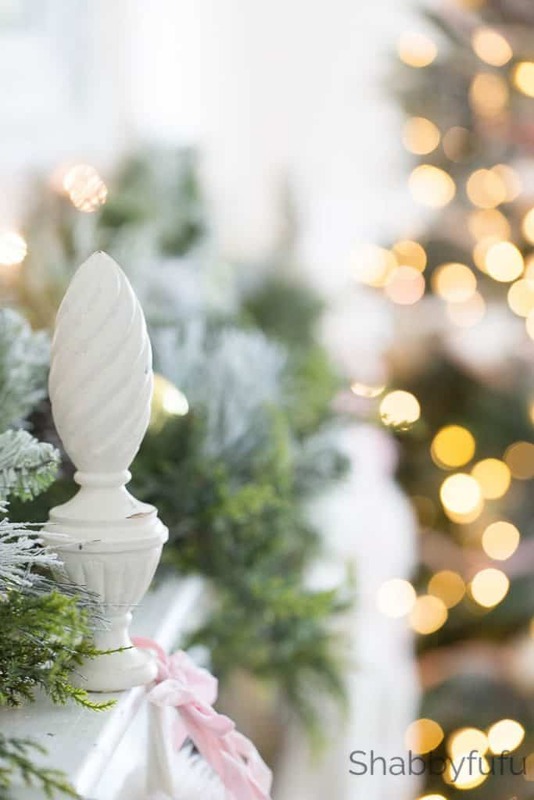 French country is always prevalent and this year I shared HOW TO CREATE A BEAUTIFUL FRENCH COUNTRY CHRISTMAS in my dining room, and this is an extension of that look. A home’s flows begins when you walk into the front door, so unless you are are purposefully doing a variety of themes for whimsy….I would keep with similar tones. Last Christmas I used this tree from TREE CLASSICS in my dining room, but I’ve been know to switch things up and it just rolled it’s way into my living room for Christmas 2017. Literally…this tree is on a rolling stand and I love that! 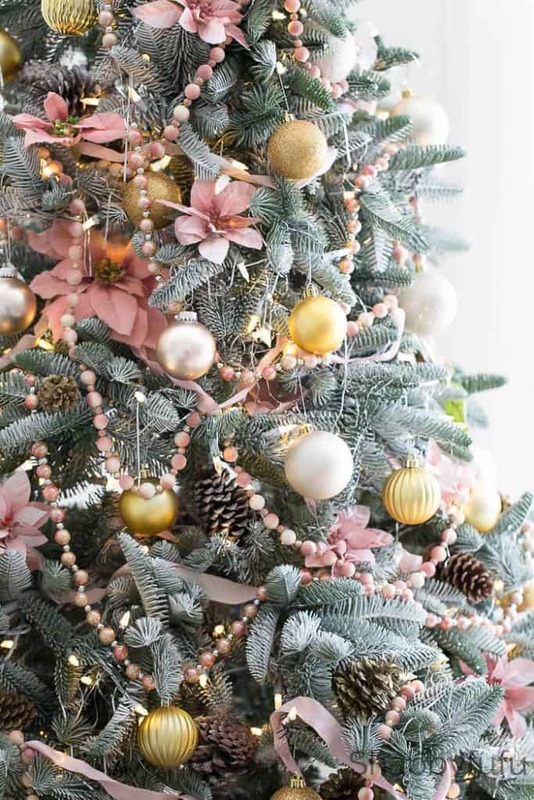 This prelit-Christmas tree I embellished with gold, blush, champagne and glittered shatterproof ornaments…along with glittered pinecones, vintage pink silk poinsettias, vintage garland and French silk ribbon that I painted by hand. 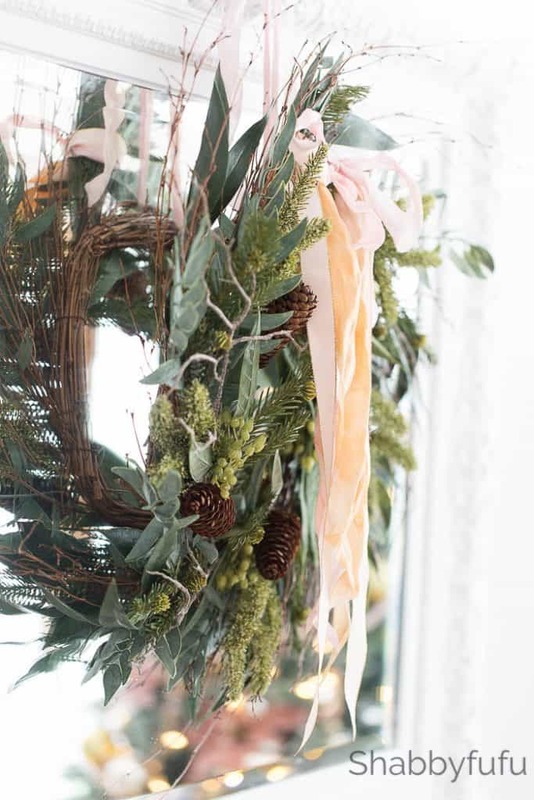 You can totally use these looks on your own trees and wreaths. 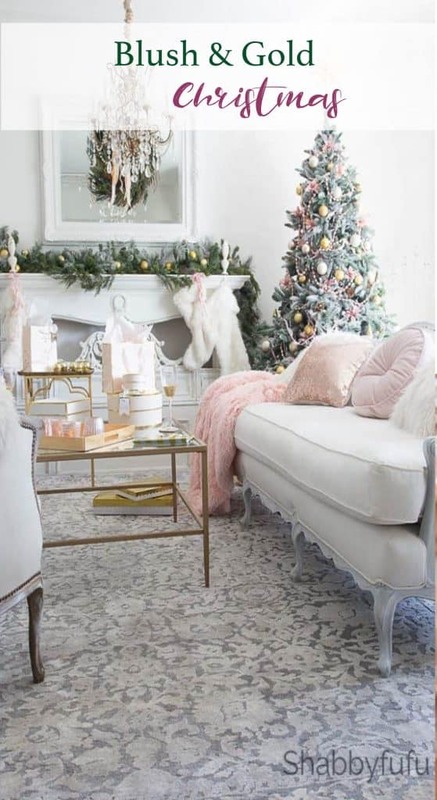 Blush pink Christmas ideas are easy to copy! Faux everything is my way to go this Christmas because it’s stress free to set up early and more green in the long run without having to toss away live greens when the holidays are over. I love THIS WREATH but it needed something more, so again I added some silk ribbon that I painted by hand with watered down paint (tutorial coming soon). Faux fur stockings are hung on the mantel. I used some old bed posts from a four-poster bed that we used to have, cut them off the top and set them on top of the small nails holding the stockings in place. The mantel greenery is faux as well and since I had this greenery last year that you can see in THIS POST, it took minutes to set into place. Ahhhh, the joys of faux! I’m so glad that my husband is finally on board with that. Simple VINTAGE TOUCHES for CHRISTMAS (post from a few years back) are something thoughtful and make you stand out from everyone else. 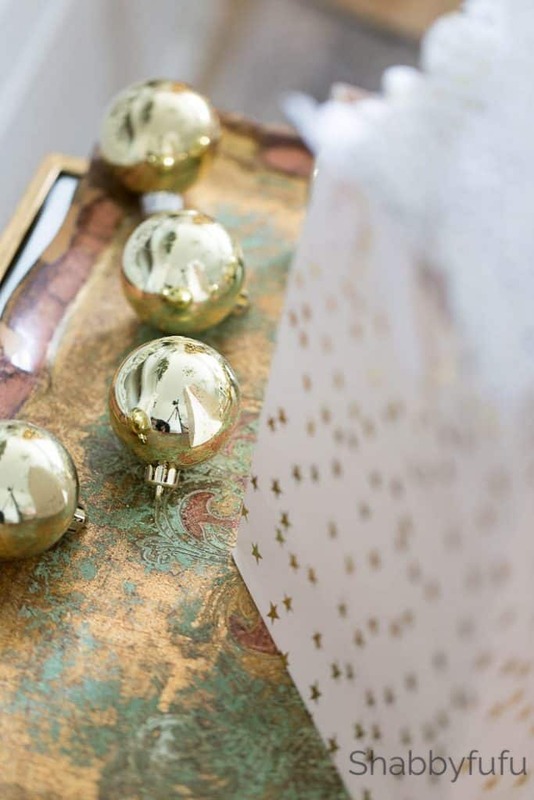 Patina on a vintage Florentine tray mixes seamlessly with new gold Christmas balls because the tones are similar. Love red? Mix old with new and it will all go together well. Just keep your tones similar and do what you like in YOUR home for the holidays. 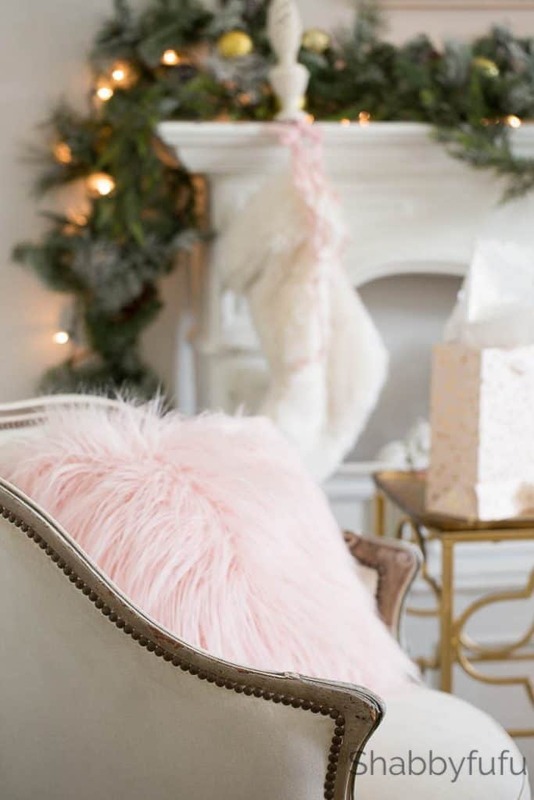 Blush pink faux fur pillows and throws are just so fun and a way to incorporate something that is more on trend without spending much.Blush pink Christmas ideas for the win! Gold and blush wrapped gifts are perfect to put under the tree, and since we open gifts right here every year I gently save the bags and boxes when I can. These are gorgeous though…I’ve linked them below. The rug is one of my favorites and I love the texture as well as the color that wears well with 3 doggos running around. 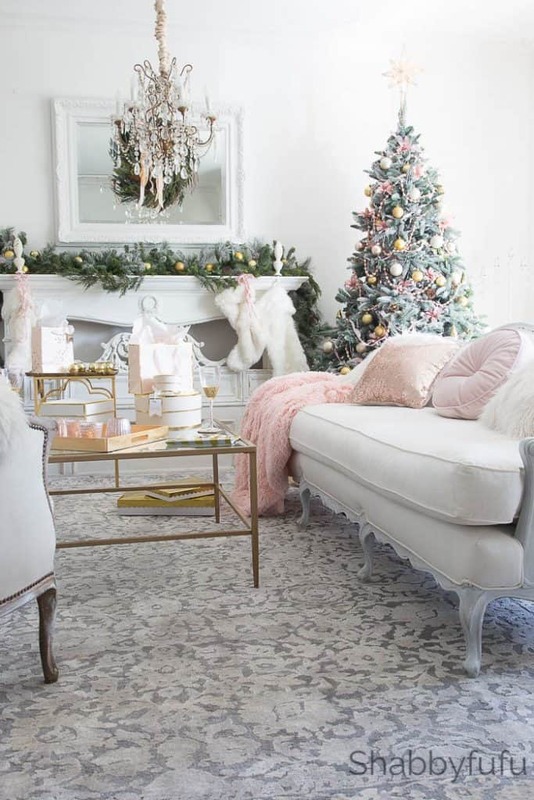 Metallic mix along with blush, grey and white is definitely my favorite look this year for Christmas and I can’t wait to share how it looks at night in another upcoming post. A little bit glammed up and yet elegant enough to be quiet. I recently read on another large decorating blog about “millennial pink” being the big thing with that generation. In my opinion it has been around forever and just comes and goes in cycles. The so called thirty year cycle in design has become shorter and lost it’s attention span, just like everything else. Everything just looks so festive and pretty at this time of year and it’s my personal favorite. 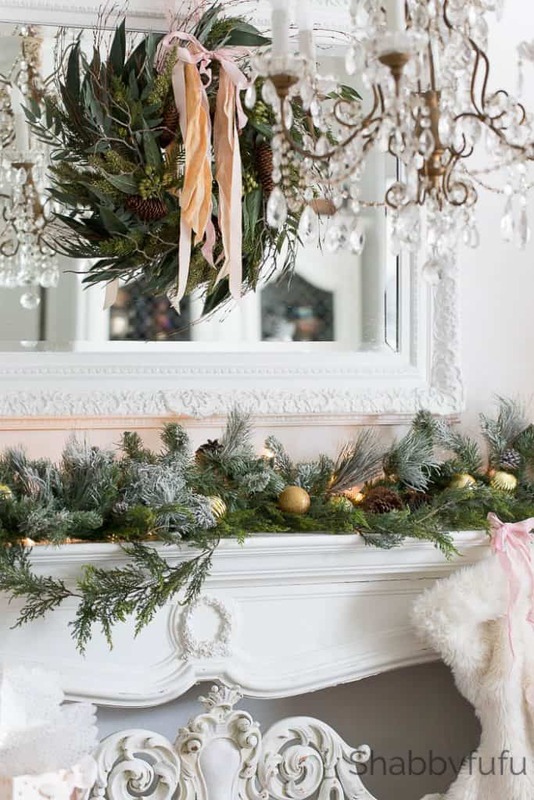 Do you love these blush pink Christmas ideas that I’ve shared today? If so…I’m sharing a Christmas tablescape this week with a group of blog friends as well as some other holiday posts I think you’ll love! Please come back often, subscribe and pin for future reference. Hi, can you tell me where this rug is from? Its gorgeous! Hi Janet! Since we flooded in Hurricane Harvey last year, we’ve moved into a new house and this will be our first Christmas in this home. Love your ideas for a blush pink and metallic theme. Great inspiration for something altogether new for this year. Since I lost a lot of furniture and we’ll as Christmas decor, I’m working with a relatively clean slate. Thanks so much for your ideas- can’t wait to get started! I’m always interested in table setting ideas, also, it’s always fun and interesting to hear about special Christmas traditions that people share every Christmas . Have a wonderful day ! Gorgeous! I’d love to see table setting and decorating ideas! Yours are always so inspiring – Christmas or otherwise! Thanks for all the great work you do! Cindy…I always appreciate you stopping by and hope that you have a beautiful week ahead! Love this room it is gorgeous! Thanks for sharing.